The Government has issued an extraordinary gazette on Wednesday listing 14 individuals as designated persons who have connections with the LTTE in terms of terrorism-related activities and funding and financing of terrorism, to the List of Designated Persons. 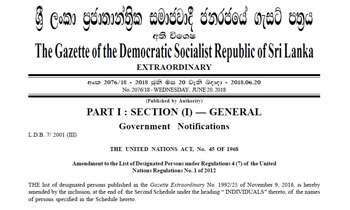 The Gazette which was issued by Defence Ministry Secretary Kapila Waidyaratne, adds amendments to the List of Designated Persons under Regulations 4 (7) of the United Nations Regulations No. 1 of 2012. LTTE intelligence Leaders Nadaraja Sathyaseelan alias Seel Maran, Antonyrasa Antony Calistor alias Parathan and Jeewarathnam Jeewakumar alias Siranjeew. Air Wing Members Velaudan Pradeepkumar alias Kaleeban, Siwarasa Surendran alias wadann, Sivagurunadan Murugadas alias Kadirawan and Thirunilakandal Naguleshwaran alias Pushpanadan. Flying Instructor Maheshwaran Ravichandran alias Mendis alias Thirukkumaran. International Financial Leader Sivasubramaniyam Jeyaganesh alias Ganesh alias Samraj. Money Collector Ponnasami Paskaran alias Jeyakaran. LTTE members Suresh Kumar Pradeepan, Kandasamy Krishnamoorthi alias Moorthi, Kamalasinham Arunakulasinham alias Kamal and Tony Jihan Murugesapillai. The United Nations Regulations No. 01 of 2012 issued by the Foreign Affairs Minister promulgating the United Nations Security Council Resolution 1373 (2001) designating individuals and entities related to terrorism and terrorist financing in national level. Under the provisions of said regulations Secretary to the Ministry of Defense has been appointed as the Competent Authority for the implementation of UNSCR 1373 and its successor resolutions in Sri Lanka.